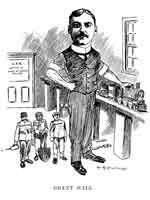 Born at Montreal on 7 November 1863, Hall began working as a fitter for the Canadian Pacific Railway at age 17. In 1904, the CPR transferred him to Winnipeg as the Superintendent of Motive Power, in charge of mechanical operations for the Western Region. He climbed the CPR Western Region’s executive ladder, becoming Assistant General Manager in 1911, General Manager in 1913, and a Vice-President in 1914. In 1918, he returned to Montreal to become a Vice-President and General Manager for the central CPR. “New Motive Power Head”, Manitoba Free Press, 1 January 1908, page 1. “Grant Hall”, Manitobans As We See ‘Em, 1908 and 1909. “Grant Hall, Veteran Official of Canadian Pacific Railway Dies”, Winnipeg Free Press, 29 August 1934, pages 1 & 5. “Grant Hall”, Winnipeg Free Press (editorial), 30 August 1934, page 13.